If you have not heard of or tried shiitake bacon until now, then I am so happy to be the one to share this totally awesome little secret with you. If you have made shiitake bacon before, then you already know how shiitake mushrooms magically taste just.like.bacon when baked in the oven on low heat for 1 hour. Amazing, right? I think so. The first time I tried shiitake bacon was when Alexandrea Jamieson came to speak at one of our classes at NKCS ... and my mind was blown. Of course, being an ex-bacon lover I was skeptical. Nothing can ever really (naturally) replace or imitate the taste of bacon, right? Wrong. 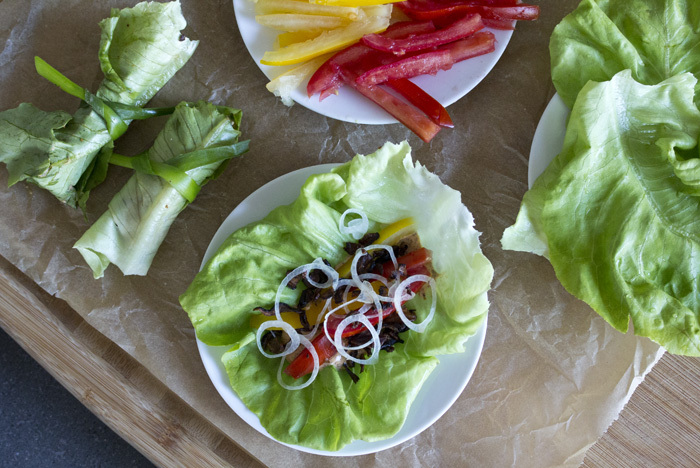 These lettuce wraps are the perfect way to get a party started. Everybody loves bacon ... right? Everybody except for people who don't eat meat, or pork, or things that are no so good for you. So, who wouldn't love bacon that came from a mushroom. You cannot go wrong. This recipe was inspired by a similar recipe by Alexandra Jamieson. It can be made totally vegan by opting to use vegan mayo. Or, you can use real mayo if you prefer and it will still be vegetarian friendly. to hold it all together: 5-7 green onions sliced in half lengthwise (look for the longest, thickest ones you can find since this is for tying the wraps), or alternatively you can use tooth picks to hold them together but I prefer the green onions since they're pretty and edible. Toss the shiitake mushrooms with the olive oil and Braggs or tamari. 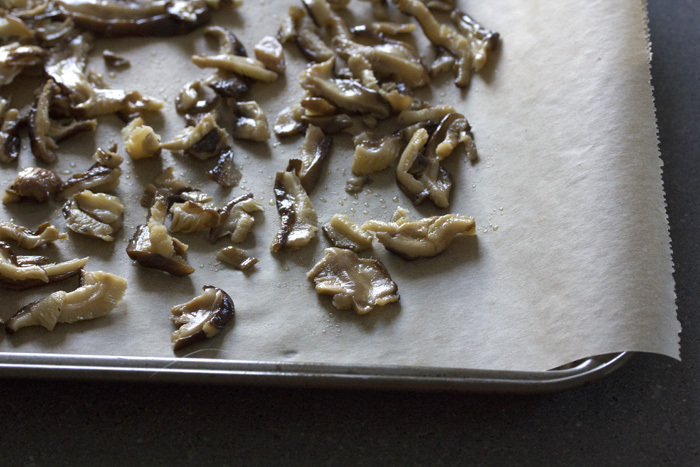 Lay them out on a parchment lined baking sheet. Bake for 1 hour, and tossing and turning every 15 minutes. The mushrooms will shrink considerably and become crunchy. When they are nice and crunchy and browned, remove and set aside. To make the mayo, combine all of the ingredients in a small bowl and stir really well until everything is combined. Refrigerate until you are ready to assemble. Place the green onion down, and a leaf of bib lettuce on top. Layer the ingredients in the center of the wrap, staying away from the ends: chipotle mayo, 4-5 slices of tomato, shallots, and then crumble the shiitake bacon on top. 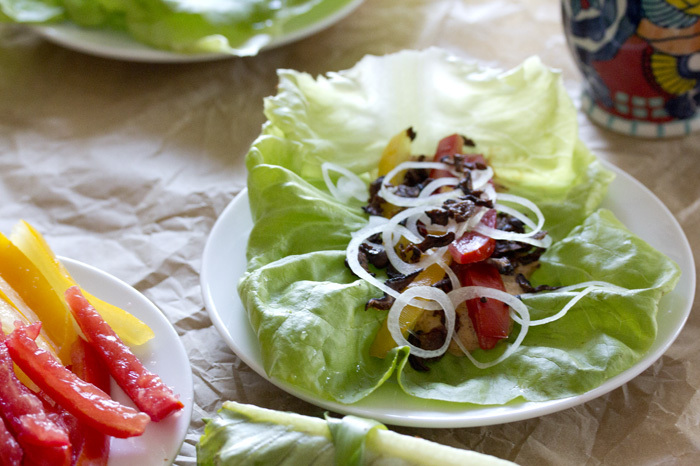 Very gently roll the lettuce wraps. If you have very large leaves you might want to fold in the sides, but just be careful that the lettuce does not rip. It might take a few tries until you start to make them look pretty. Tie up the wrap by very gently making a knot with the green onion. If you are careful it should not rip, and it will hold nicely. Continue until you have used up all of your (useable) lettuce leaves. Serve immediately, or you can make ahead a few hours and keep in the refrigerator until you are ready to serve.